It’s always a treat to interview the legendary John Williams. A few weeks ago he talked with me about scoring The Post for longtime colleague Steven Spielberg; about his eighth Star Wars movie, The Last Jedi; and about his plans for 2018, which include a theme for Solo and a new concert work celebrating the centennial of Leonard Bernstein. I also interviewed Last Jedi director Rian Johnson, actor (and fan) Mark Hamill, and fellow composers David Newman and William Ross, about the iconic composer’s place in movie and music history. 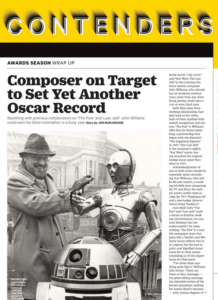 The story is in this week’s issue of Variety, including a collection of Oscar trivia related to the composer. In a separate story, I explore the maestro’s first animated short subject (which itself is also Oscar-eligible this year), Dear Basketball, based on the Kobe Bryant poem. 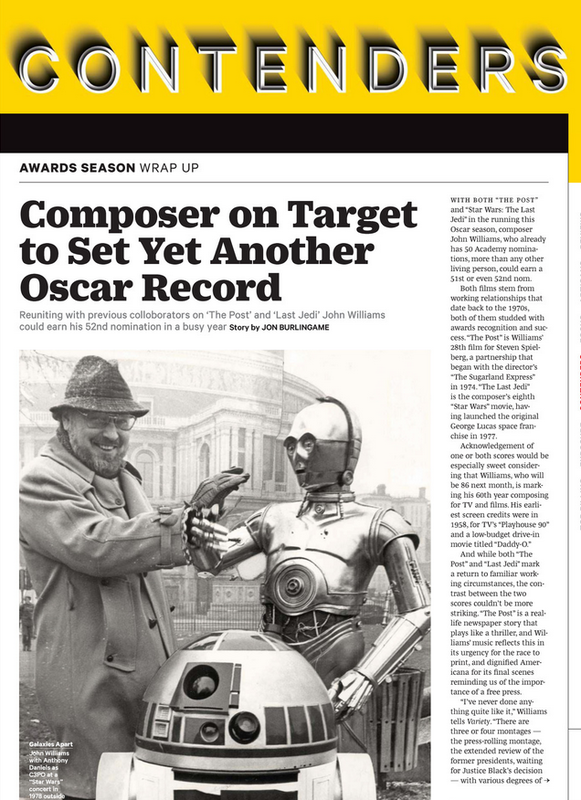 This entry was posted in Composers, Film Music, Interviews and tagged John Williams, Mark Hamill, Rian Johnson, Spielberg-Williams, Star Wars Episode XIII, The Last Jedi, The Post, Variety on January 10, 2018 by Jon Burlingame.